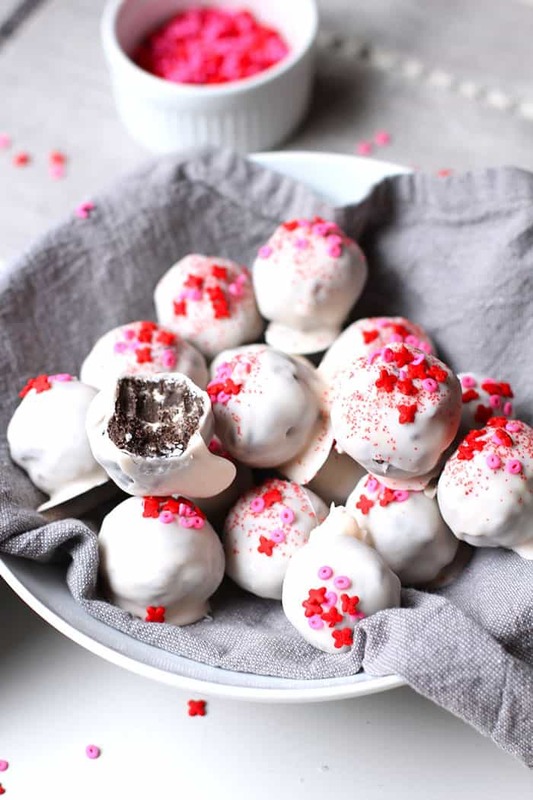 White Chocolate Oreo Truffles are a simple no-bake delectable dessert, featuring Oreo cookies, cream cheese, and white chocolate. Tailor them for any holiday! Who loves a four-ingredient recipe (counting the sprinkles)?!! EVERYbody. So it seems appropriate to use four words to describe them, don’t you think? 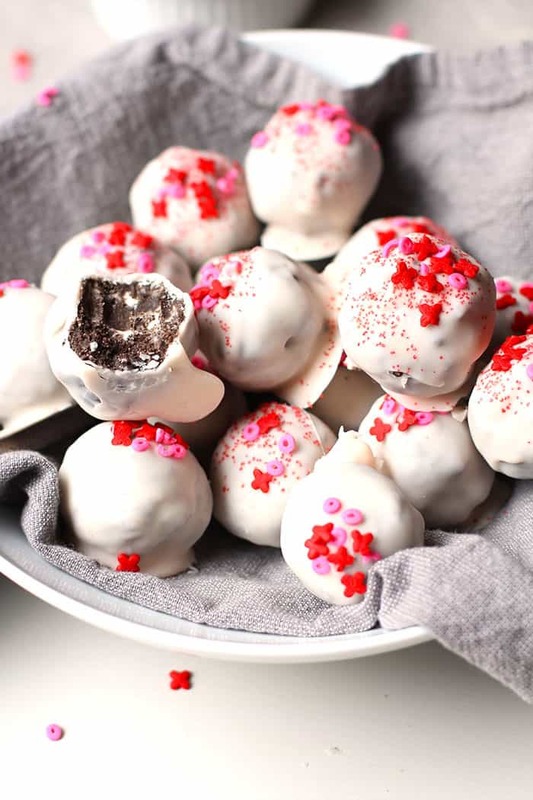 White Chocolate Oreo Truffles. Four ingredients, four words. Makes perfect sense! My youngest loves Oreo cookies. Maybe even more than my homemade treats. GASP! I decorated these with Valentine sprinkles but you could definitely decorate these for ANY special celebration or holiday throughout the year. AND if you need other Valentine’s treat ideas, I’ve got some. My Chocolate Sweetheart Cupcakes and my mom’s Best Chewy Sugar Cookies are YUM. If you enjoy cooking with your kids, this a perfect one because it is SO simple. Use food processor to grind up the oreos. Use hand mixer to mix the cream cheese with the oreo crumbs. Use hands to form mixture into balls. Quick freeze balls to make handling them easier. 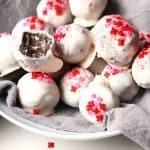 Dip frozen cookie balls into almond bark and shake some sprinkles on top (quickly before the chocolate sets). 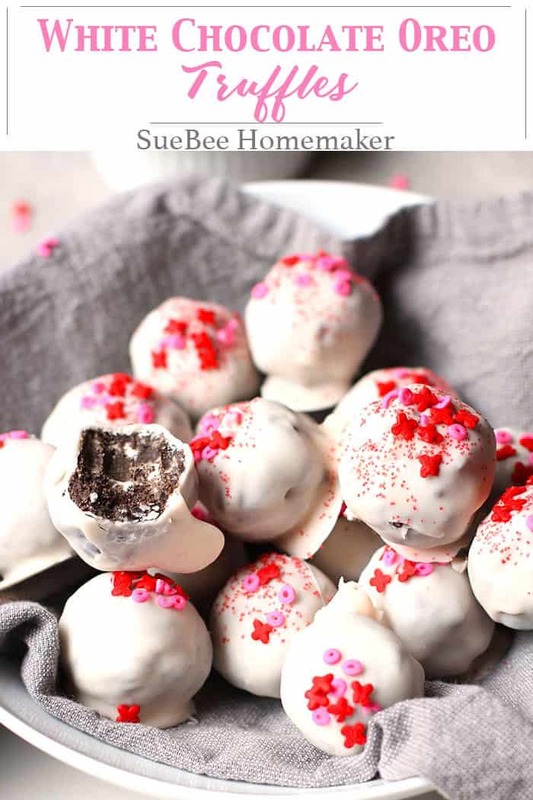 A simple no-bake delectable dessert, featuring Oreo cookies, cream cheese, and white chocolate. Tailor them for any holiday! Pulse oreos in food processor until they resemble course crumbles. Add crumbs to separate mixing bowl. Using a hand mixer, mix the cream cheese with the oreo crumbs until well blended. Using your hands, roll one inch balls. You should get approximately 18. Place them on a sheet pan and place in the freezer to "quick freeze" them for better handling (approximately 30 minutes). Melt the almond bark in the microwave for about two minutes (stirring every 30 seconds) using only 50% power. The chocolate should be smooth and creamy. Be careful not to over-cook. Dip the cookie truffles in the almond bark using a dipping tool (amazon purchase mentioned above). Roll the truffle around in the chocolate until it is completely covered. Lift it out using the tool and place on baking sheet lined with parchment paper. Decorate with sprinkles (quickly, before the chocolate sets). Place cookie sheet in freezer for about another hour to freeze truffles. Then stack them in airtight container and store in either the refrigerator or freezer. I made these for work birthday treats and they didn’t make it out of the house! They are delicious!! I’m trying again this weekend and I hope not to eat the entire lot! Thanks Brittany! I hope you try them! ? 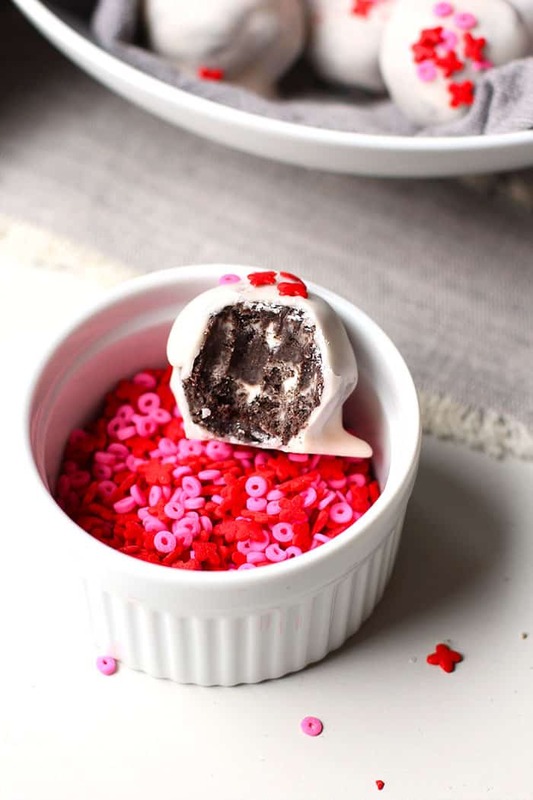 I usually only make Oreo truffles at Christmas time, but they look so cute with the Valentine’s colored sprinkles, I may have to make them!